Though reflects an ancient idiom is actually a modern day Kukri Knife forged to slaughter, slay, slash and destroy whatever may come on its way.. Raw power within, brutal force, lethal blow, deadly consequence, fearsome look are some of the synonymous characters this 12 inch long bladed “Gladiator” holds like that of the true gladiators of the ancient Rome. One of the latest additions of KHHI, it has been unleashed to satisfy the harshest critics and to please the toughest users. Its RAW (straight from charcoal oven) bevel gives the perfect hardened edge needed to soften the hardest opponents, where as its full flat hexagon shaped SIX riveted handle gives the strongest grip needed to endure the abusive usage. Gladiator though reflects an ancient idiom is actually a modern day Kukri Knife forged to slaughter, slay, slash and destroy whatever may come on its way. I add a photo or two of the gladiator. After two years of very heavy use in not always the best conditions this work of art has more than proven its worth. This workhorse will be a lifetime companion. Difficult to express all the gratitude I already have felt in so many different situations for having this king of knives around. I might even have a second one some day with some slight adaptations. 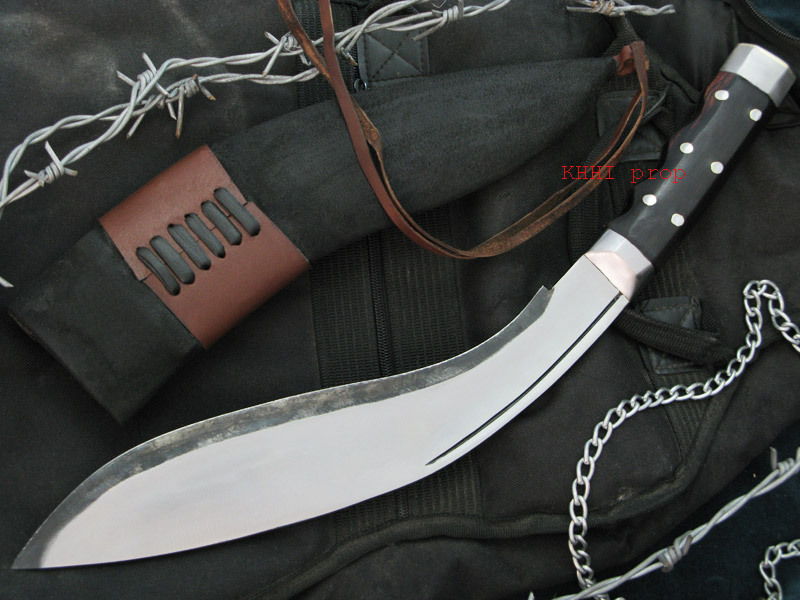 I have just taken delivery of the Gladiator khukuri from your company. I am so delighted to be the owner of such a fine piece of Nepalese craft. The workmanship and attention to detail is fantastic, and I would be extremely grateful if you could extend my thanks to master craftsman Santosh for his magnificent creation. My whole experience with your company has rekindled my enthusiasm to travel to your fine country once again. If I cannot manage it this summer, then I shall be sure to come next summer. I look forward so much to meeting you and making more purchases of your fine products. Thanking you again for such a beautiful creation.